Prepare your defenses: Blizzard is about to expand its base. A report from the Orange County Business Journal has detailed a recent land expansion by StarCraft and World of Warcraft studio Blizzard Entertainment. Maybe you've heard of it? According to the report, Blizzard could be preparing for a huge offensive against rival factions. Or, it just needs more space. 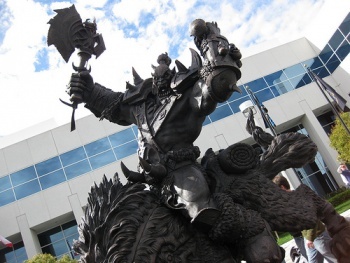 The OCBJ says that Blizzard recently signed a lease for two new buildings located near its already huge headquarters in Irvine, California. Blizzard's current HQ takes up around 235,000 square feet of space, and the new buildings will add another 100,000. That's an approximate expansion of 40%. Why would Blizzard need to expand? Well, duh. World of Warcraft is mega-popular and its third expansion is set for release next month. StarCraft II is also mega-popular and still has two more parts on the way. Diablo III is about to be mega-popular when it's eventually released, and Blizzard is exploring bringing the game to consoles. Meanwhile, Blizzard still has a super secret MMO in development. With 1,100 employees currently grinding away at Blizzard, the extra 100,000 square feet of space could be just the amount of elbow room that the doctor ordered. It's said to be one of the largest expansions for a technology company in the area since Blizzard doubled its office space in 2007. The new space might not be guarded by an Orc, but expect some kind of similar protection to be put in place.